My husband and I bond over Shark Tank. We fantasize about creating this amazing product as a hubby and wife duo that makes a multimillion dollar deal with the sharks. This usually happens in a groggy state of mind at 8:30 when we’ve finally gotten the kids down, so the ideas aren’t exactly flowing. I may never invent a product that will make me rich, but I do make a mean skinny fiesta chicken soup. Deep thoughts. I guess it’s better than debating about who changed the last poopy diaper or reminding each other to set the auto brew on the coffee maker. I am not sure why it was so hard to believe I (yes, the food blogger) made this soup from scratch. I mean, duh, I make everything from scratch. But I get it, sometimes we are so tired as parents that we forget what our spouse is good at, or even what their name is. This is why we need coffee. This is why it’s IMPERATIVE one of us remembers to set the auto brew. Also imperative – this paleo snickers coffee creamer. Priorities. 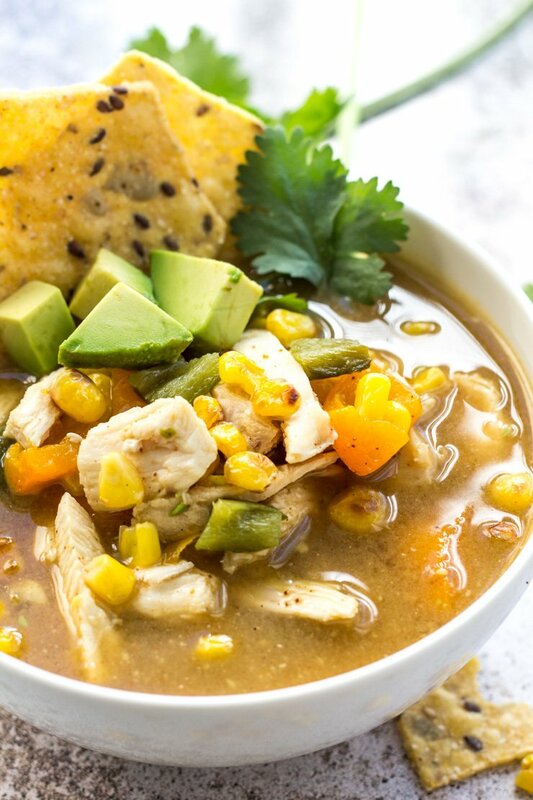 This skinny fiesta chicken soup has all the makings of a winning “rotate-worthy” dinner. 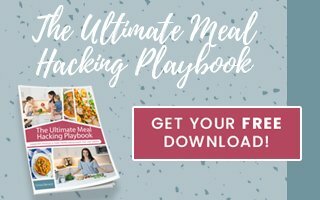 It’s the perfect way to warm up in the winter, or serve at a party watching the big game. 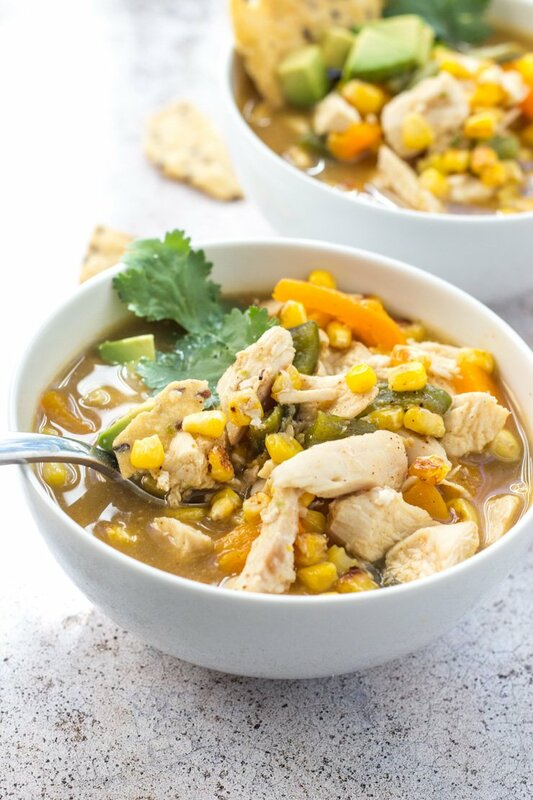 Unlike many broth-based tortilla soup recipes, this one has an extra ingredient to give that broth a thicker ‘wow’ factor. The variety of roasted peppers, jalapeños, slightly charred corn with juicy pieces of chicken combined beautifully with all those traditional Mexican spices. Just makes me want to dance thinking about it. Ooo ooo ooo and I forgot to mention, this is a soup you can garnish the crap out of. I’m taking lots of cilantro, diced avocado, and a few tortilla chips if that floats your boat. It’s the quintessential dinner to prep for Shark Tank and scheme big dreams. 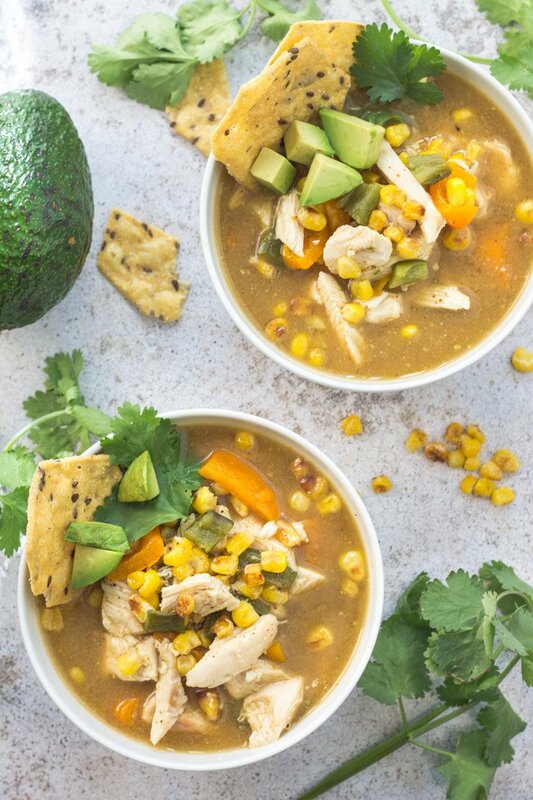 *Spoiler alert – I’m thinking of pitching my chicken and avocado broth. Mr. Wonderful would surely be a fan. Cook chicken breasts beforehand and store in the refrigerator to save on cook time. You can also use leftover shredded chicken if desired. Precut all vegetables and have spices measured and ready to go. For an extra dose of vitamins and minerals, use this bone broth recipe instead of store-bought broth! EVER? It’s a really great show. I think this soup and an episode or two is calling your name girlfriend! Oh I hope you do Cara!! I’m glad you believe in my shark-tank-worthy broth concept 😉 Knew I could count on you! You like Shark Tank? Me too! It’s so much fun seeing different people’s ideas; I especially loved seeing how Wild Friend’s got their start through the investment that they received there! Maybe you could start a restaurant with tortilla soup as the MAIN important recipe? YES! Isn’t that SO crazy! The kids that pitch ideas on that show are amazing too – blows my mind. HA, I’m game with that. You want to come help me manage it? I love soups like these! The flavors sounds amazing!! Yum!! They totally are. Everything just works perfectly together. Thanks Emily! We can dream!! Love that you made this in a vegetarian way! The avocados sealed the deal 🙂 Looks fantastic! Avo’s have a way with that don’t they? Well you definitely sold me on this soup, looks ammmmmazing!! i am loving all that toppings, it makes a huge difference. YES! It makes me feel like a food artist! And who doesn’t love toppings? Oh funny post. 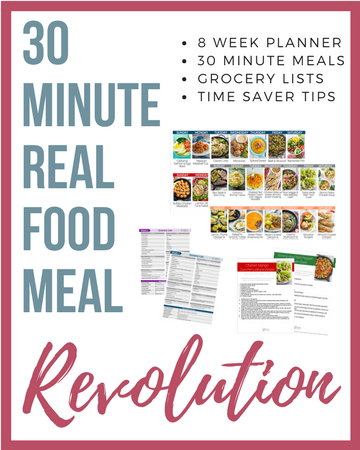 I love this recipe and saved it into my recipe library. It looks easy and yummy. Love the different options. Oooh I feel special!! Thanks Chrissy – hope you love it! Oh now this is something my husband would like. He loves anything mexican just about. DEFINITELY a favorite with my hubby! He loves crushing tortilla chips all over this and going to town! Such a coloring and pretty soup. Love all the latin flavors in this. Definitely a fiesta I want in my belly! It looks yum! I hope you both totally love it Kerri! This looks so good! I love soups this time of year! 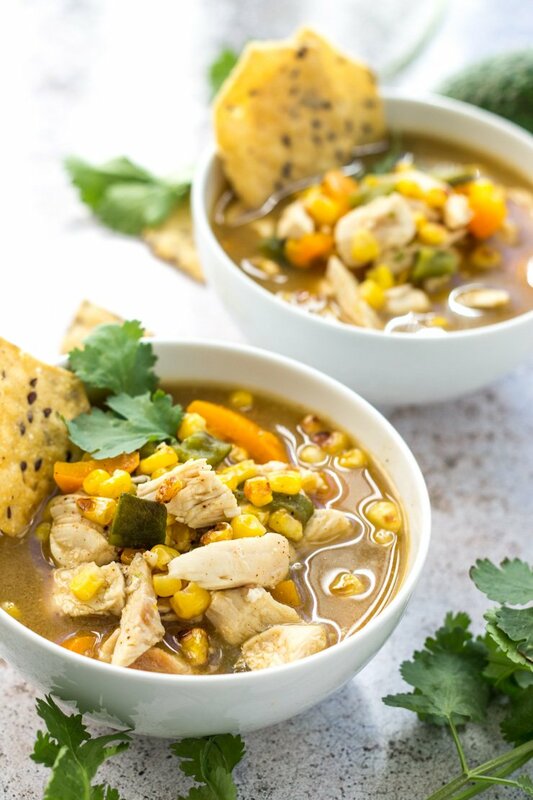 I have lots of soup favorites, but this recipe is definitely my top 3! 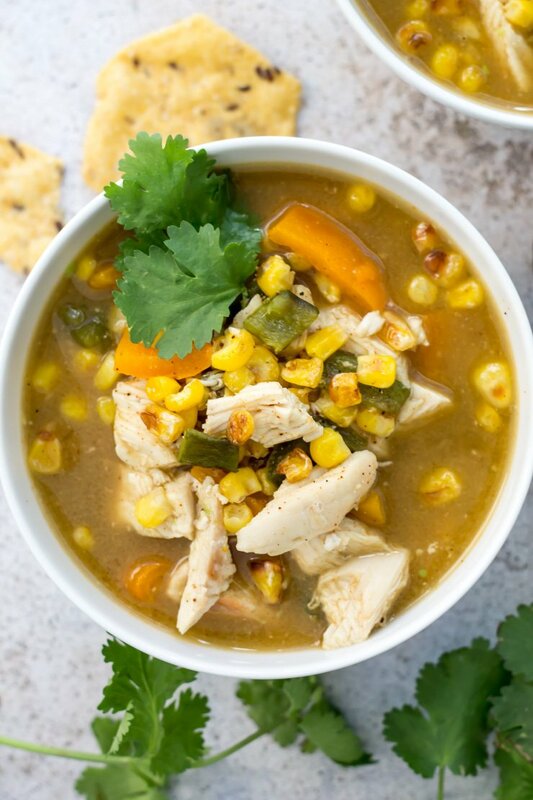 This soup is indeed Like a great fiesta! I can almost smell the spices through the screen!! ? Chrissa this looks so good and I can easily make it vegetarian. Am I the only one still enjoying soup season?